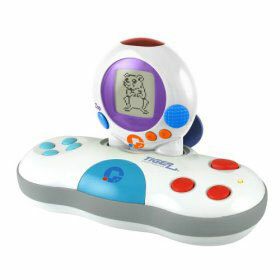 Virtual Pets Blog » Blog Archive » Giga Pets return! Hasbro (Tiger) has relaunched the famous Giga Pets from the early days of keychain pets. The new pets are available in several animals to suit both boys and girls (scorpion andÂ bunny shown here). They are much more rounded in appearance than the early pets. We include a photo here of the original Digital Doggie from the early days for comparison. You can see considerable difference in the styles. Pets include Dragon Lizard, Bunny, Pixie (sort of like Tinker Bell), Scorpion and Tomcat. More power hungry than the earlier versions, the new units require three LR44 batteries. 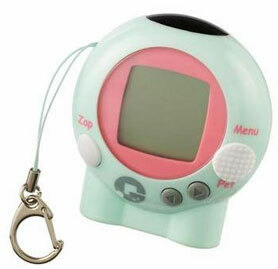 Hasbro also has an optional TV game controller called Giga Pets Explorer that allows you play with three more virtual pets on your television, and explore Giga Island. Plus you can plug in one of your Giga Pets to play with it directly on the TV screen. One of the packages indicates they have a Panda, Monkey, and Pooch as the three online games and it looks like they are selling it with a mouse for the handheld pet. Instructions for Giga Pet Explorer are online. 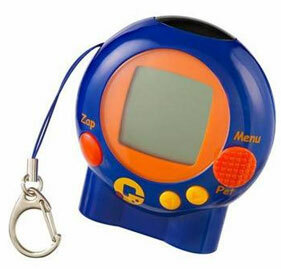 The old Giga Pet Digital Doggie is shown below for comparison with the current pets. Welcome back Giga Pets! OMG! i love giga pets im 10 years old and they rock!!!!!!!!!!!!!!!!!!!!!!!! my mom is getting me new batteries today because i use it so much the batteries die on me…….